Allianz Insurance Co. Ghana Ltd.
Short Business Description: We are one of the leading insurance groups in the world. Our product portfolio includes a wide array of property-casualty and life/health insurance products for both private and corporate customers such as Motor insurance, Home insurance, Fire insurance and other contingencies, Personal and Group Personal Accident Insurance. Atlantic International Holding Company Ltd.
Short Business Description: We represent the world leaders of computer equipment and solutions, air conditioning and ventilation systems, medium and high voltage electrical equipment for power transmission amd distribution and office furniture. operations in Ghana in 2011 after the Bank of Africa Group acquired the majority interest in Amalgamated Bank on 2nd February 2011 and has 26 branches. Our vision is to be the preferred Bank to our chosen markets. Our range of products and services covers Retail Banking, SME Banking, Corporate Banking and Treasury"
Short Business Description: Bayer is a Life Science company with more than 150-year history and core competencies in the areas of health care and agriculture. With our innovative products, we are contributing to finding solutions to some of the major challenges of our time. Our operations are managed in three divisions – Pharmaceuticals, Consumer Health and Crop Science – and the Animal Health business unit, which are also reporting segments. Our goal is to achieve and maintain leadership positions in our markets. Short Business Description: "The Bosch Group is a leading global supplier of technology and services, active in the fields of Mobility Solutions, Energy and Building Technology, Industrial Technology, and Consumer Goods." Short Business Description: C. Woerman (Ghana) Limited is a technical trading and service company operating in the fields of Power Generating Sets, Heavy and Light Construction Equipment, Forklifts, Industrial Machinery, Power Tools, Spare Parts, Tyres as well equipment for Transport, Agriculture and Forestry. Among others we print represent the companies Stihl, Michelin, Bomag, Bosch, Continental, Jost, Luk, Mahle, Ruggeberg, Abac and Schrader. Short Business Description: Consolidated Shipping Agencies Limited (CONSHIP), a reflection of an orientation to provide quality services across all spheres of the logistics industry, commenced operations in 1996 as a limited liability company primarily focusing on ocean freight forwarding. Short Business Description: The Economic Community of West African States (ECOWAS) covers 15 countries with a population of more than 300 million, among them Ghana and Nigeria. With improving framework conditions for investments, these countries feature high growth rates and increasing investments of domestic and foreign enterprises. The private sector is taking a dynamic development. Our current portfolio amounts to a volume of approximately 756 million euros focused with additional potential on agribusiness and food industry and on the infrastructure sector. Short Business Description: DHL operates in over 220 countries worldwide expressing transportation of documents and parcels with passion for the customer, respect for the people, honesty and integrity, and drive for excellence. With the vision to become the logistics company of the world, make our customers, employees and investors more successful, demonstrate respect without compromising on results, simplify our customers’ lives, and make a positive contribution to our world. Short Business Description: Ecoband Networks provides comprehensive and flexible satellite, microwave and fibre optic based solutions for Internet backbone connectivity well as broadband and MPLS services. Short Business Description: Our products and services include imports and sales of transformers (various sizes), generators, induction motors, household electrical appliances, cables and wires; repair and rewind of alternating machines, electrical installation (industrial, commercial and electrical installation (industrial, commercial and domestic), substation construction and consultancy services; and quarry (stone aggregates). 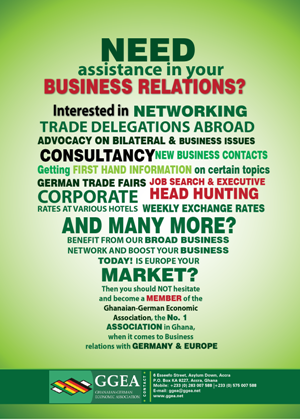 Short Business Description: The German Embassy team is looking forward to informing you on German-Ghanaian relations as well as providing you with a variety of information on Germany. The Ambassador is the representative of the German President in Ghana. Maintaining good political relations with the host country is the utmost priority for every German Embassy. Short Business Description: Fine Print (Ind) Ltd., is a major Paper Converting company in Ghana and the works is located in a sprawling 22 acres of land in the Heavy Industrial Area of Tema. Though the company was started purely as a trading company, in view of the good demand from the market, it diversified into manufacturing of various converted products of paper. The products included sheeted papers of all types needed by the market from Newsprint to Bond paper to Art paper, brown paper, manila board, Label papers and many more. Short Business Description: GEMC Logistics is the logistics and supply chain wing of German Equipment & Machinery Limited (GEMC) which is a registered private limited liability company in Ghana. GEMC is a fully owned Ghanaian entity established to sell heavy duty equipment and machinery in partnership with GP Papenburg of Germany. Short Business Description: "Ghacem is the leading cement company in Ghana. We are “The nation builder”. The company was established in 1967, and has played an important role of building Ghana through more than 50 years of operations. Ghacem has two cement grinding plants in Tema and Takoradi, and a network of sales offices and depots throughout the country." Short Business Description: "Ghana: Africa’s Golden Gateway. We are the one-stop agency that facilitates and supports local and foreign investors in both the manufacturing and services sectors as they seek more value-creating operations, higher sustainable returns and new business opportunities."